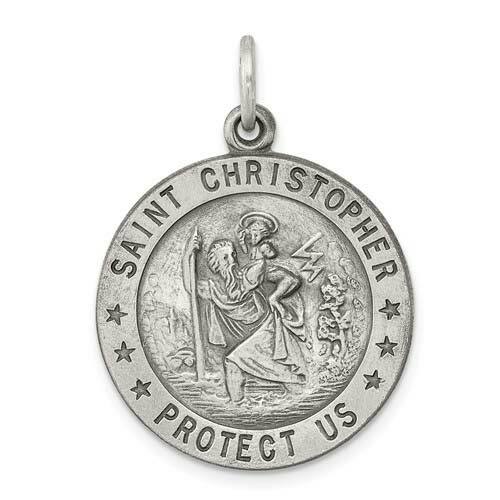 Sterling silver round St. Christopher medal has an antique finish. Measures 3/4 inch tall by 3/4 inch wide without bail. Chain not included. This item is slightly larger than a penny. Die struck. Made in USA. I bought this for my boyfriend for our anniversary, He has been wanting one for a very long time. The finish on this product does not stay. On the back of the charm there are MANY scratches and marks and the top coat of the finish is coming off very easily. He still likes it but i wish it was made with a little more care. I bought this for someone special to me that lost this particular medal and everything else she owned in the 2011 Pleasant Grove, Al. tornado. Though she lost the one from her father because of the tragic event, I hope this will bring back all the cherished memories & keep it close to her heart as she wears it.